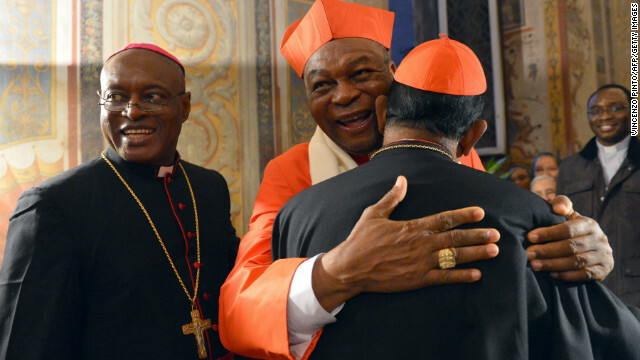 Nigerian Cardinal John Onaiyekan has said he would not be surprised to see an African pope in his lifetime. Editor's note: Stan Chu Ilo is professor of religion and education, director of field education, at St Michael's College, University of Toronto, Canada. He is also author of: "The Face of Africa: Looking Beyond the Shadows" and "The Church and Development in Africa: Aid and Development from the Perspective of Catholic Social Ethics." (CNN) - Cardinal John Onaiyekan of Abuja, Nigeria, was asked last week at the celebration of Black History Month in Toronto if he thought that the time was ripe for an African pope. His answer attracted much cheering from the crowd of over 500 Catholics of African descent. He said: "The time for an African pope was ripe even in the time of the Apostolic Fathers in the first century of the church." "I am not saying that I wish to be considered for the papacy, but the fact that the Gospel is to be preached to all peoples, languages, and races means that the highest leadership of the church should be open to anyone from any race, language and nation. I will not be surprised to see an African pope in my lifetime." Hell yeah! I hope we get an African Pope! That way, if somebody attacks the Church, I can call them racist! What a nice, pointless gesture to distract from the fact that the Catholic Church is directly responsible for the deaths of millions of men and women and especially children on the continent of Africa. After that, perhaps they can pick a victim of clerical abuse, and then we can just call the whole last millennium a wash! An African pope is a great idea. What better way to expand the church's r a p e program, than to let an African lead the faith. Seeing as how Africa is the r a p e capital of the world the RCC could expand the program from little boys, to women, infants, the elderly etc etc etc. I feel blacks are more spiritually gifted than whites. A black pope is a good idea his upbringing as a child is important, education, must be able to handle global problems + other religions as the whole world is in such a mess now. ALL RELIGIONS ARE FOUNDED ON CONCEPT OF DISCRIMINATING PEOPLE, GLBT, BLACK, WHITE, BROWN, UNTOUCHABLES, OR CONVERTED. Is there anything in the Quaran about true love of God/Allah why do they kill their own/maim/abuse their families especially.If there is no love, your words + advice are like sounding brass. Everyone has a spiritual part of their brain, study parts of the brain. All pray or commune with God whether they are aware of it or not. First governments, and now religions, all want to be politically correct. And they should not be a presence in the political arena, either. So only a white man can be considered for pope? I thought it was a spiritual calling. And as for as violence goes isnt that how Christianity was brought to the new world?